The classic Hi-Shok design from Federal is an affordable choice for evaluating the functioning of hollow point rounds in your firearm. This .40 S&W load will work great in a variety of popular self defense pistols including the Smith & Wesson M&P, Browning Hi Power, Springfield XD, and Ruger SR40. It uses a medium weight 180 grain bullet for typical .40 S&W ballistics as well as non-corrosive Boxer primers and reloadable brass cases. 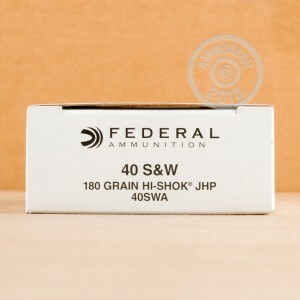 Federal Premium Ammunition is one of the US's top ammo manufacturers, and offers several self defense brands such as HTP and Hydra-Shok. 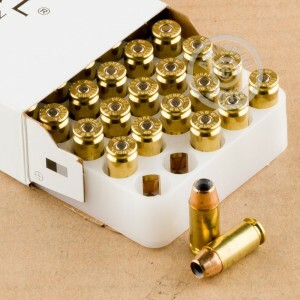 This ammo is packaged in a 1,000 round case, divided among 20 boxes of 50 rounds each. As with all orders at AmmoMan.com over $99, this case ships for free from our warehouse to your doorstep!